"Seismology, Seismic Data Analysis, Hazard Assessment and Risk Mitigation"
The GFZ section Physics of Earthquakes and Volcanoes carries out annual training courses on "Seismology and Seismic Hazard Assessment". These courses are part of the educational and training program of the UNESCO in the field of geosciences and disaster mitigation. 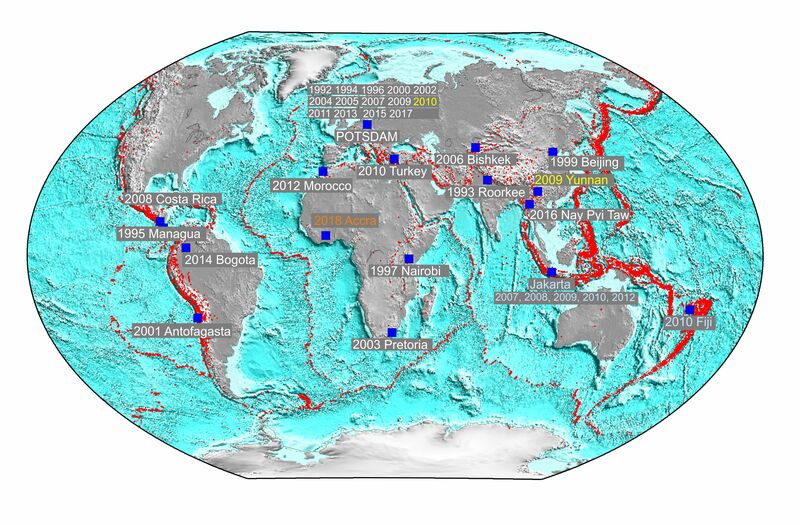 The courses provide theoretical fundamentals and practical training in applied seismology, especially for geoscientists and technicians from developing countries. The program is particularly useful for seismological station and network operators, data interpreters and those concerned with seismic zoning and hazard assessment. The courses are held alternately in Potsdam, Germany, and in an developing country. Starting with this year there is an important extension for further qualification available. Former course participants can apply for additional support from the International Training Course. In case of ideas for a project, or an interest in gaining further qualifications, please submit a short application (1 page). The proposed project should build upon the background you gained as a course participant. We can provide (for a short period of time) a limited number of instruments, as well as software tools for data analysis. The aim should be to produce a common publication for submission to an international journal. Any acquired data will have to be made publically available in an electronic form. You will need a partner (lecturer) from the training course. The training course 2019 will take place in Potsdam, Germany from August 12 to September 6, 2019. Here you find more information about the past courses.